Chowder? Isn’t that about seafood? Well, yes, often it is. But “chowder” is really just a generic name for a type of hearty stew—usually one that’s cream- or milk-based, and typically thickened with potatoes or crackers. So why not a chowder built around winter squash? Squash has great flavor and is abundant in grocery stores throughout the US this time of year. Mix in some corn and bacon, and you’ve got a dish with magical flavor. Dished up in quantity, this chowder makes a great main course for weekday dining. Ladled out by the cupful, it’s a starter you’d be proud to serve to company. No clams needed. This recipe requires cooked squash, which you can prepare a day ahead. If you need a recipe for preparing it from the raw stage, see the roasting instructions in our prior post on Winter Squash Gratin. I use acorn squash in this dish, but you can substitute any winter squash—they all work. You could also substitute cooked frozen squash if you like. BTW, exact quantities aren’t critical in this dish. You can use a little more or less squash, potatoes, or corn, for example, and still have a delish dish. Prep time for this recipe is about 15 minutes, total cooking time half an hour or so. This recipe yields 3 to 4 main-course servings, or 6 to 8 first-course servings. Leftovers keep for a couple of days if stored in an air-tight container in the refrigerator. Cut the bacon into ½-inch pieces. Place the bacon bits in a 4-quart pot or Dutch oven, and turn the stovetop heat to medium. Sauté the bacon until it’s crisp and brown. When done, remove the bacon bits and set them aside. Meanwhile, peel and cut the onion into ½ inch dice. Peel the garlic and mince finely or cut into thin slices. After you’ve removed the bacon bits from the cooking pot, add the onion and garlic and sauté in the hot bacon drippings until the onion becomes translucent (about 8 minutes). While the onion is cooking, wash the potatoes. Peel them if you choose (it’s optional), and cut them into dice of ½ inch or less. When the onion is translucent, add the thyme, diced potatoes, and chicken stock to the pot. Bring to a simmer, and cook until the potatoes are tender—when you insert the tip of a paring knife into a potato piece, you should meet no resistance (this usually takes 10 minutes, although it may take as much as 15). Add the cooked squash. At this point, I usually zap the chowder briefly with an immersion blender to break down the potatoes a bit, thickening the chowder (see Notes). After blending, add the corn, bring back to a simmer, and cook for 5 minutes. The chowder will be very thick. Add milk or cream to thin the chowder and simmer for a minute or two. (Add more milk if you want a thinner soup, less if you want a thicker one.) Taste and, if necessary, season with salt and pepper (I often let people do this at table). Sprinkle with bacon bits, parsley, and perhaps some red onion pieces (the last one is very optional). When roasting squash, I often do a big batch at one time and use it to make several different squash dishes. Like this one! I like to use thick-sliced bacon in this dish, though you can substitute salt pork if you’d like. Salt pork is actually traditional in chowders, but I prefer the flavor of bacon. I prefer milk to cream in this dish. Cream makes it a bit too rich, IMO. I use whole milk, but skim certainly works if that’s your preference. Frozen corn generally is high quality, and I never hesitate to use it in a dish like this. But of course fresh corn makes a dandy substitution (if it happens to be available). When using an immersion blender in hot liquid, make sure you use one with a metal shaft. With a plastic shaft you risk cracking the shaft. Ask me how I know! Oyster crackers or Saltines are often served with chowders, and make a nice accompaniment. Yum, this would be well loved at my house for lunch, dinner or as an appetizer soup. Love all the hearty veggies! Such a bright fresh photo too! You make such yummy soups for you and the Mrs. With the cooler weather this would certainly be a hit in my house and leftovers would be a welcome treat. So now that I have a new camera maybe you and the Mrs. can give me some pointers over coffee. Let me know! I second Mrs K R - we love all things squash, too. This is a lovely chowder! I was just rearranging the freezer and found some corn, so I have everything to make it this week. Since we don't eat bacon I'm going to sub some smoked salmon in for the added salty flavor and texture. Thanks for sharing! This does sound lovely and although I'm not a fan of squash you might have persuaded me with this! Looks like I need to buy extra squash when I get some for the gratin recipe. Delicious looking recipe. Lovely Chowder. I always make big batch of roasted squash or pumkin and freeze the puree for other uses like in muffins, pancakes and curries. I never tried it in soup though. Thanks for sharing the recipe!! Hi Chris, this really is a fun soup both to make and eat. Loads of flavor! Thanks for the comment. Hi Vicki, new camera? Sounds like fun! What did you get? Anyway, we love making soup! And obviously do it a lot. ;-) Thanks for the comment. Hi Hannah, smoked salmon would be wonderful in this! And I do so love corn in chowder. Thanks for the comment. Hi Caroline, don't worry, this is my last squash recipe for a while. ;-) But I do think you'd like it in this soup - it has a fun flavor. Thanks for the comment. I am a sucker for chowders and this is one I would devour! Love the addition of squash - I have to try this! Hi Karen, I actually roasted the squash both for the gratin and the soup at the same time! Saves work. ;-) Thanks for the comment. Hi MJ, I think it's squash, but I'd vote for squish. ;-) And yes, I do love my immersion blender! Kabocha is a wonderful squash - it'd be great in this dish. Thanks for the comment. Hi Shibi, it's a great idea to freeze the puree - so nice to have on hand! Thanks for the comment. Hi Alyssa, this really does have nice flavor. I think you'd enjoy it. Thanks for the comment. This 3-4 serving soup would only serve two in our house! I find corn, squash and bacon are irresistable on the own, but put them togther and WOA! Hi Shasi, I can see this serving only 2! In our house it's more like 3 servings, and we're big eaters so I figure most people would get 4 out of it. ;-) Anyway, I think you'd really like this! Thanks for the comment. Perfect for the season...and quite delish! There is something about bacon and a chowder that will make me eat any vegetable hidden inside it! YUM! I am so wanting this now! I love chowders over soup, because i believe in piling on extra calories over the winter! But really, they taste so good and rich and filling and are perfect for cold weather. The flavors in this are perfect and i can't wait to give it a try. The photos also are very photogenic, I must say! This is the epitome of comfort food! Absolutely luscious flavors in this soup, John. I could go for a big bowlful myself! Hi Denise, isn't this nice? And delish is the word! Thanks for the comment. Hi Laura, bacon does that to me, too. ;-) Thanks for the comment. Hi Abbe, yeah, piling on extra calories in the winter is one of those habits I have too. ;-) Thanks for the kind words, and comment. Hi Georgia, I need to make this again, but I'm hungry for it! It's good stuff. ;-) Thanks for the comment. I saw this earlier and meant to leave a comment then but got sidetracked. This chowder is perfect, especially for fall. I love the winter squash in it, whodathunk?! Great creativity, and taste! Every time I see the word chowder my inner Maine speaks to me. Chowdah! It usually had clams or lobster in there but your winter squash, corn and bacon really speaks to me. Hi John , your chowder will hit the spot ay my house Friday , we are having terrible weather and this is just what we need , thanks for sharings :). Oh my goodness, this looks and sounds delicious, John... you are twisting my arm with the pumpkin recipes... bookmarking this now! Hi Greg, we do have wide-ranging conversations! Thanks for the comment. Hi Dan, isn't this nice? Loads of flavor, and a fun recipe. What could be better? ;-) Thanks for the comment. Hi Maureen, seafood is also what I think of first when I think chowdah, but this variation is really nice. Thanks for the comment. Hi Nee, glad I could help you plan a meal for the terrible weather you're expecting! Thanks for the comment. Hi Lizzy, this is a fun recipe. Super flavor and easy - hard to resist, huh? ;-) Thanks for the comment. Hi Amy, this is really a nice recipe. And you're right that it's very warming in cold weather! Thanks for the comment. Now I know what to do with my leftover squash. Thanks. Hi Malou, I always get got at bacon too. ;-) Thanks for the comment. Hi Pamela, leftover squash should work great in this! Thanks for the comment. I love potatoes and corn in chowders, but I can get used to squash too. This actually makes a nice change from the usual roasting the squash. And it would be a great starter for Thanksgiving, though I have to say, I do avoid soups for Thanksgiving because then you have to set out bowls, too much extra crockery!! It's amazing how the weather went from 75 degrees one week to 65 the next. You can really feel it's fall now. Well, at least in California. 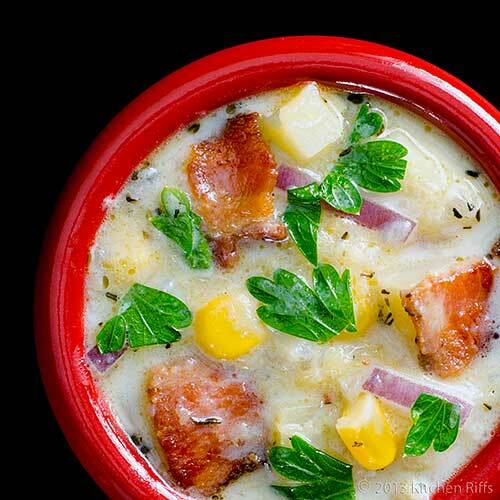 A creamy, chunky chowder like this is exactly what I'm craving on these chilly nights. Brilliant! I don't like clam chowder all that much, but I have no doubt I would love this version. My husband is a chowder fan in all forms. What a great and inventive adaptation of the classic! Thanks for sharing! Hi Nazneen, potatoes are in most chowders, and corn in quite a few; but the squash makes a nice change of pace, IMO. I do think you might be right about soup and too much crockery for a big dinner like Thanksgiving! Thanks for the comment. Hi Carolyn, fall is such a nice season, isn't it? Soup (and chowder!) season. ;-) Thanks for the comment. Hi Zoe, I always think clam first, too! Squash isn't at all typical, but it's a nice way to serve it. I think you'll like it! Thanks for the comment. Hi Monet, this sounds like a great compromise chowder for the two of you! Definitely worth trying, IMO. ;-) Thanks for the comment. Yummy, this looks like my kind of soup, so inviting and perfect for colder days. I've never head nor seen a squash-based chowder, John, but I saw your title and thought, "I'm in!" This sounds like a wonderful chowder and not at all difficult to prepare. I'm sure this post will be shared more than a few times. I wonder how many Thanksgiving dinners will begin with your chowder? Thanks for sharing another of your fantastic recipes. Hi Kiran, it is a nice combo of both summer and autumn! And a delish one, too. ;-) Thanks for the comment. Hi Daniela, pork of some sort is traditional in chowders, and the bacon is such a nice addition! Thanks for the comment. Hi Charlie, doesn't it look nice? Most chowders are indeed seafood, but there are all sorts of other ones out there. 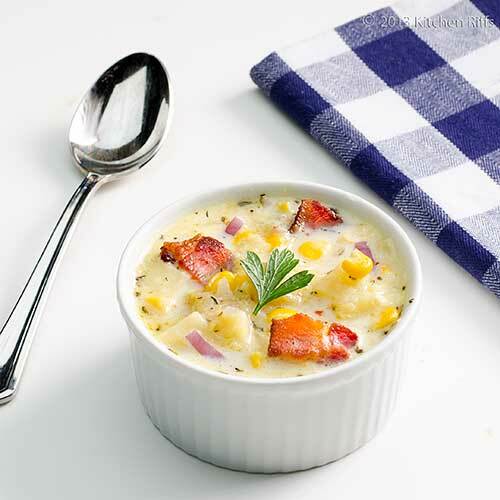 Corn chowder (with or without bacon) is a really popular one. Thanks for the comment. Hi John, I'm not sure if I've ever seen a squash chowder either! I've seen plenty of squash soups before, but they tend to be thinner. And since this made with a chowder base (the pork, onions, potatoes, and stock, with milk added later), it's chowder! A chowder is really nothing more than a type of cream soup, when it comes down to it. Thanks for the comment. Oh yes, I'll have seconds of the chowder please. It's all in there, the savories, the cream, the bacon ... perfect. All the colors in this are so pretty! It would be a very comforting dish this time of year. What a delicious looking chowder!! Hi Judy, this really is an extremely satisfying recipe - just loads of flavor and comfort factor. Thanks for the comment. Hi Laura, I must admit I do like color in food! Thanks for the comment. Hi Ashley, it really is delish. Loads of flavor. Thanks for the comment. Hi Louise, wow, 5 squash for $1??! Terrific deal. And you're right, one can never have too many winter squash recipes. Or summer, for that matter. ;-) Thanks for the comment. Another one of my favorites. Never tried making it at home but have to now after seeing this post. So comforting and perfect for this weather! Hi Cquek, thanks for those very kind words, and for taking time to comment! Hi Asmita, isn't this so nice? Great flavor and totally comforting! Thanks for the comment. I love chowder, but adding winter squash to it never dawned on me before now! What a great twist! I am never a big fan of seafood chowder, but this one anytime. THe cream based stew sounds delicious especially with the squash. Perfect for a fall party. Hi Liz, winter squash takes chowder in a whole 'nother direction. And a better one, I think. Thanks for the comment. Hi Asha, isn't this nice? All the flavor of chowder with something new. Thanks for the comment. I am not a sea food person, this chowder though is one I can have and love. Hi Sawsan, I'd think you'd have a lot of fun playing with flavors in this dish - there's so much one can do! But as is, pretty tasty. ;-) Thanks for the comment. Hi Bam, I'm pretty sure most teenagers would just ignore all that nutritious stuff underneath the bacon if you pile it on! Thanks for the comment. I love chowders, and yeah, it's usually associated with seafood. This looks really good, nice colours too. And bacon makes everything taste good :) Will have to try this soon! Hi Fern, isn't this a pretty chowder? And squash is such a nice change from seafood! And I agree bacon makes everything good. ;-) Thanks for the comment. Hi Julie, squash chowder is such a nice change from seafood! It'll definitely surprise your husband. ;-) Thanks for the comment. With the time change and all, I haven't eaten breakfast yet. Know I want a comforting dinner with this chowder/soup!!! Hi Debra, time changes do mess one up a bit, don't they? What stinks is it takes a week or two for me to adjust to the new time in the spring. In the fall? More like 5 minutes! Thanks for the comment. I have a butternut squash on the counter that I couldn't decide what to do with. I couldn't face another creamy butternut squash soup. Love this idea! Your chowder looks deliciously creamy, chunky, packed with the good stuff! I never make chowder (it's not really an Australian thing) but your photos have convinced me that it's a worthy cause to venture into! Pity it's summery temperatures at the moment. As soon as the weather cools down it's going to be a chowder night! Hi Kristi, butternut squash would be wonderful in this. Plus it's a nice change of pace. Thanks for the comment. Hi Laura, although I often eat clam chowder in the summer, most chowders are really a cool weather thing. 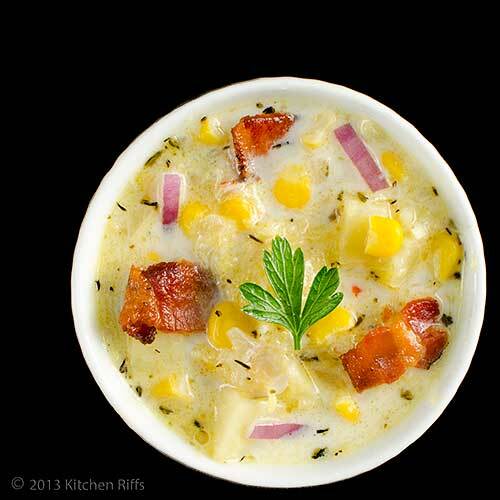 The exception is corn chowder, IMO, which is wonderful with freshly picked corn. Thanks for the comment. That chowder looks so tasty. Yum! I am in for this chowder Looks so nice and hearty! Hi Dawn, isn't this nice? Truly good stuff. ;-) Thanks for the comment. That looks so wonderful and I could definitely adapt it to fit my diet. Hi Suzanne, this really has tremendous flavor. And really makes a nice meal-in-a-bowl. Thanks for the comment. Yum! !, this is my kind of soup, so inviting and perfect for cold days. Hi Sowmya, isn't this nice? Squash adds such a great flavor to this! Thanks for the comment. Oh I love (kids love) chowder, and doesn't have to be seafood at all. 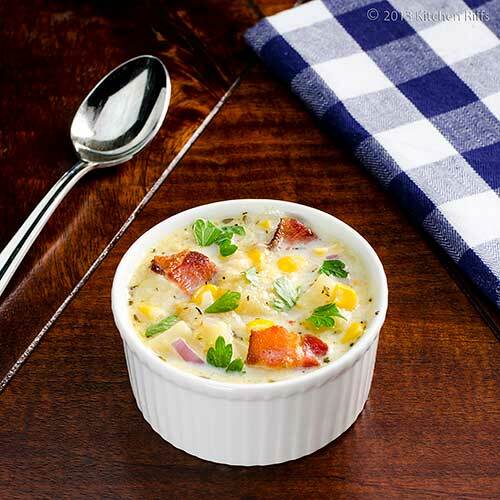 My son's favorite chowder is corn chowder with crispy bacon on top. Hmmm looking at your photo and thinking about this chowder make me want to cook this! This is such a comfort food for our family! Hi Nami, corn chowder is such good stuff! With or without bacon (although I prefer bacon!). Thanks for the comment. that some people think they don't like winter squash makes me sad: in my experience, it seems that if someone doesn't like it, it's because someone at some point prepared it poorly. I've converted several people to the squash party, and this would probably take care of the rest of them. Love the flavors here, for sure: a nice (inexpensive) alternative to clams. Hi Shannon, I agree with you that most people who don't like squash probably haven't had it properly prepared. We'll convert 'em one at a time, yes? ;-) Thanks for the comment. Not too good about the outcome for the Cardinals but your delicious chowder will help St Louis residents to forget their troubles and 'lick their wounds' (no pun intended). Hi Fran, that wasn't a good outcome for the Cards at all! But the better team won, and congrats to the Red Sox. And yes, downing some of this chowder will indeed help us lick our wounds! Hi Dana, isn't this a nice recipe? Instant deliciousness, as you say. ;-) Thanks for the comment. Love this chowder, it look so inviting and mouth watering. Great combination. Thanks for sharing. Hi Amelia, isn't this nice? Great flavor! Thanks for the comment.